By itself, the Core version of the popular Leatherman handyman's multitool already offers an option for nearly any situation. 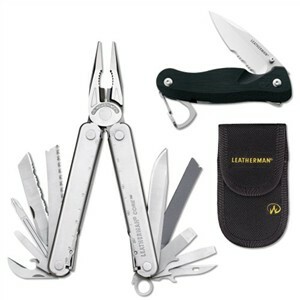 Twelve foldout blades and the central pair of pliers feature the quality construction you should expect from Leatherman. The Core also has some new tricks to share which multitool users have wanted for years. Two knife blades -- one serrated and one plain-edged -- plus hollow ground screwdriver bits for precision screws and lockback on all blades in the kit. You'll also find the usual file blade, saw, and more of the familiar bits you always need. Add to this the Crater pocket folding knife with 2.6-inch combo serrated blade of 420HC high carbon stainless steel, and you have a sound fundamental tool kit for pocket and belt. The Crater C33LX also has a couple of interesting features you'd not immediately spot. The lockback isn't a surprise, but the lightweight handle material resists most chemicals including DEET -- if your hand has ever stuck to your tools after putting on mosquito repellent, you'll appreciate this. The Crater offers more than one carrying system with a folding carabiner clip and an optional stainless steel pocket clip. With all that, the Crater still weighs only 2.36 ounces. The Core Multitool comes with its own belt sheath of nylon fabric with Velcro flap closure.